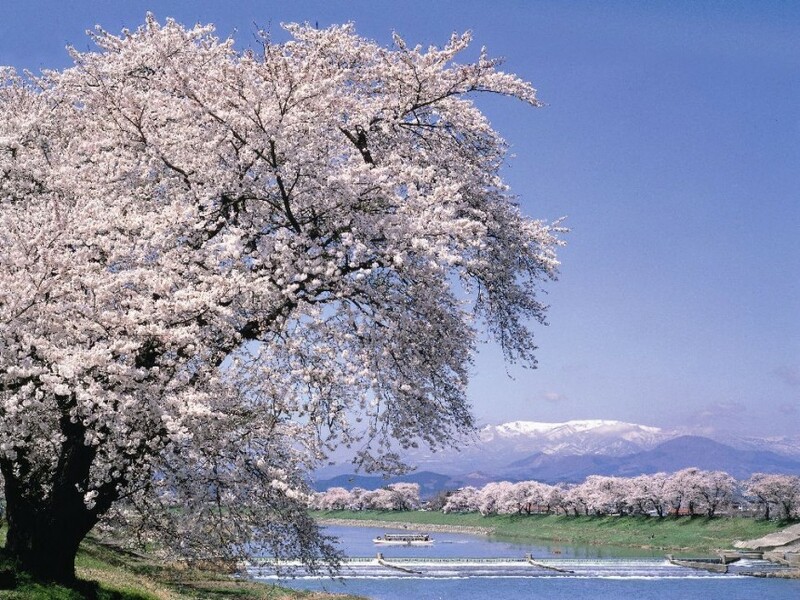 Few can resist the beauty of sakura (Japanese cherry blossoms). During hanami (sakura-viewing outings), those lucky enough to reside in Japan can collect quite a bunch of memorable experiences. 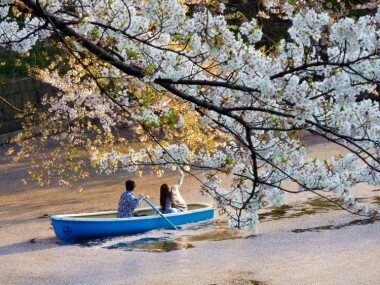 A child catching the very first yamazakura cherry petal in their palm; lovers kissing under the somei yoshino tree; a romanticist embracing nostalgia under the fugenzou (a sakura bloom with a tinge of red) — these are amongst the country’s yearly occurrences. 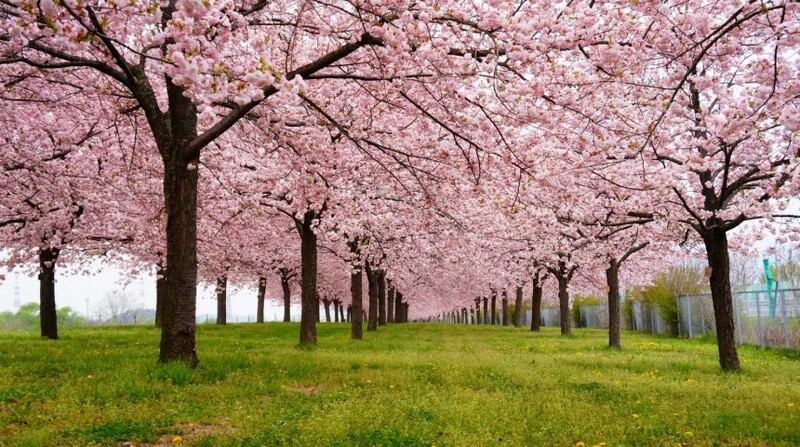 Sakurazutsumi is a 4km cherry blossom dike stretching along the Chikuma River. 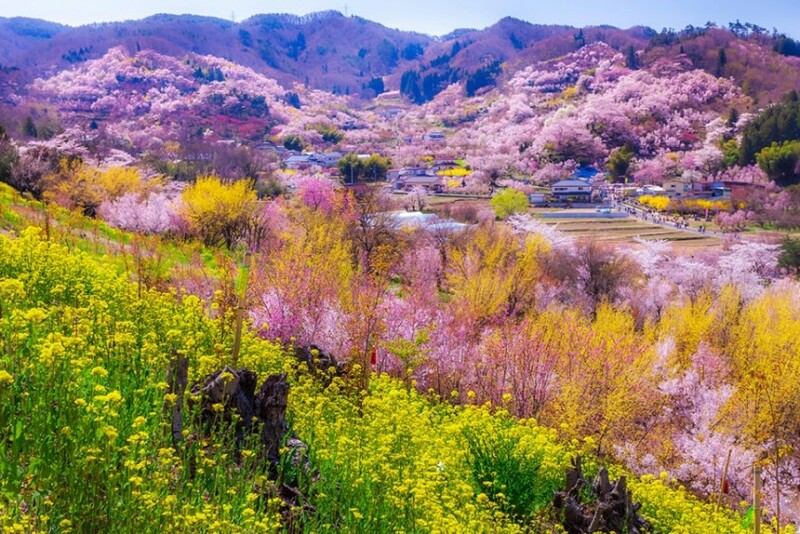 This sakura forest, which homes approximately 600 ichiyo (double-cherry trees), is the perfect place for a deep dive into the hanami experience. Bloom: end of April – middle of May. Location: 381-0205, Obusemachi, Kamitakai District, Nagano Prefecture. Access: A 25-min walk from Obuse Station on the Nagano Electric Railway (Nagano Line). 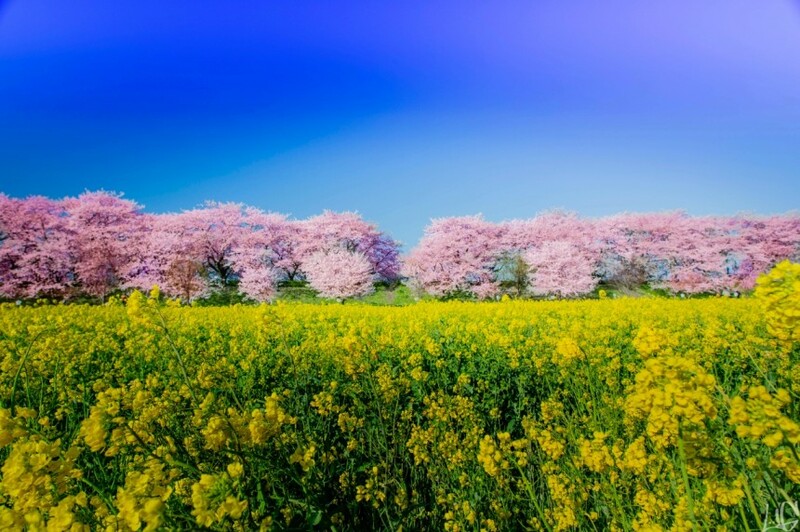 A 1km tunnel of 1,000 majestic yoshino cherry trees combined with a vast field of canola flowers. Don’t you feel like galloping around that yellow sea, just reading about it? The promenade leads all the way to Lake Miyuki, where you can sit by the water and enjoy being one with nature. There are plenty “Mt. 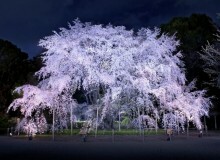 Fuji hanami” recommended view sites in every tourist guide. Here however, the river that runs from the village towards the mountain offers a distinctively scenic location when combined with cherry blossoms. Stroll alongside 200 yoshino trees, enjoying the view of crystal snow topping the magnificent Mt.Fuji. A petite bridge of the Shinagawa Shrine completes the perfection. This park, surrounding the 700-year-old Takato Castle with approximately 1500 trees, opens up to a fantastic view of the Japanese Alps. The Castle Park cherry blossoms have distinctive red-tinted small petals that are considered the best in the whole country. 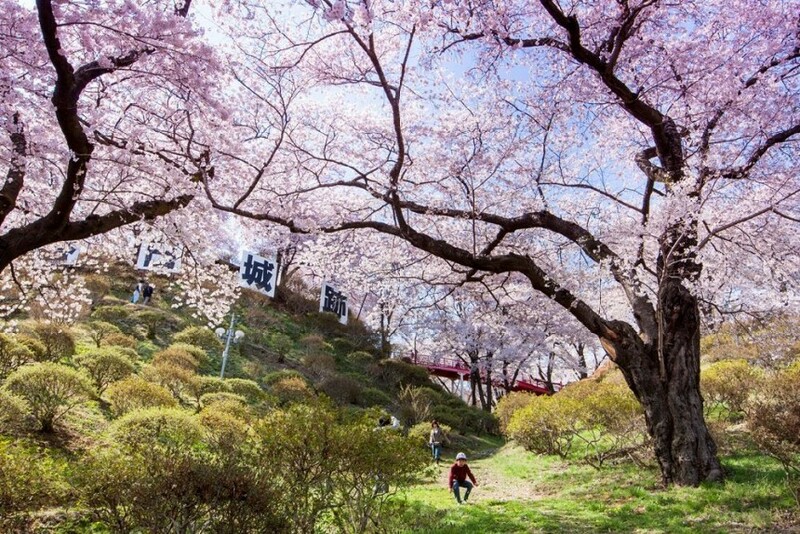 A truly unique hanami experience; created by local farmers who planted flower trees and ornamental plants on the hillsides around their land, Hanamiyama Park offers laid out trails surrounded by flowers which lead to cherry blossom-covered slopes on the south. The longer trails lead up to a viewpoint at the top, from where you can look over Fukushima and the Azuma Mountains. 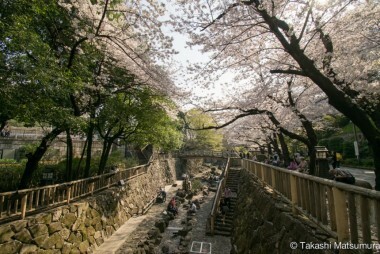 A place for those drawn to waterfalls and those who enjoy viewing cherry blossoms in great abundance. The walk promises approximately 1,200 trees stretching along an 8km river path with the snow-capped Zao Mountain range in the background. 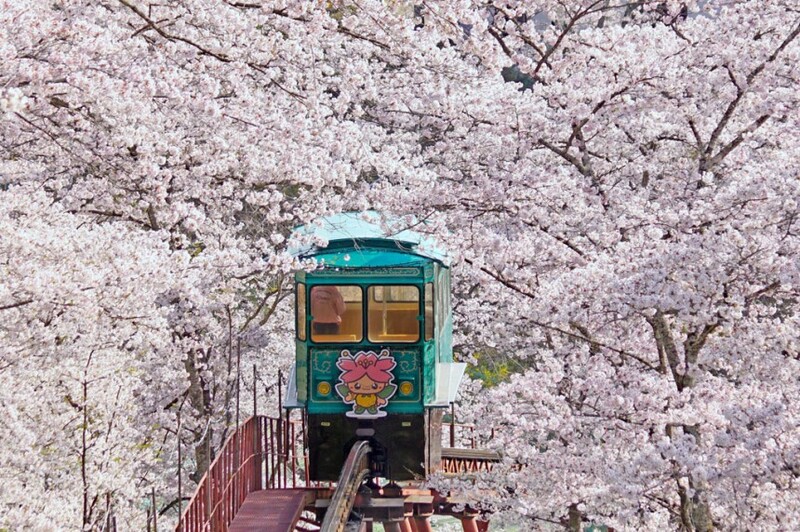 Another great Miyagi spot, but this time with an adorable monorail that runs through a whole tunnel of cherry blossoms. Funaoka Peace Kannon is situated at the top of the mountain, where you can enjoy captivating scenery. 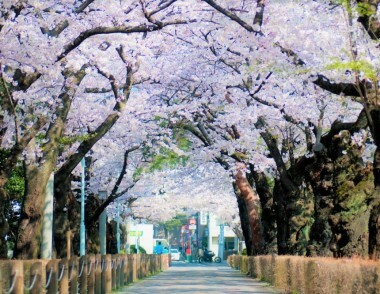 The location is also famous for “Shibata Cherry Blossoms Festival” at the beginning of April. A fabulous view with pure waters and few people, certainly worthy of your attention. Whatever it is you want to do – reading, picnicking, or painting – the spot offers you its quiet shelter. 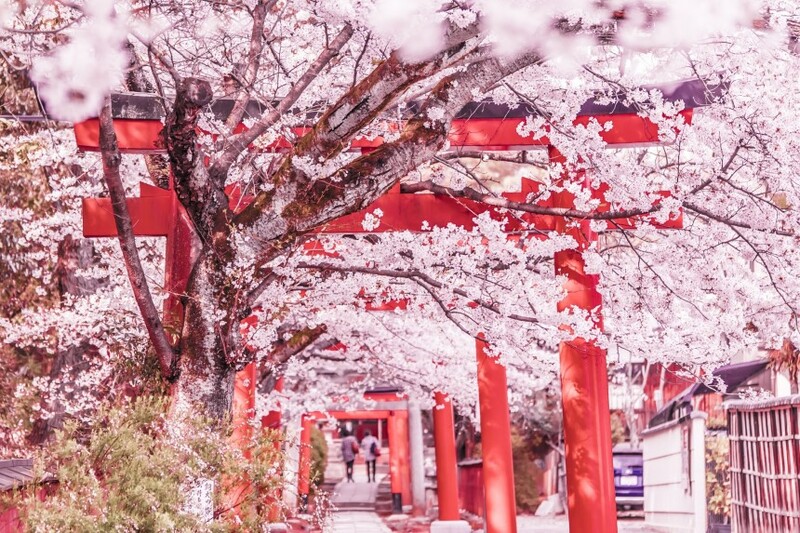 The combination of red torii gates and cherry blossoms makes the shrine look like a dreamy candyland. Dress up in a yukata (non-formal version of traditional kimono) and walk around the shrine with friends, snapping photos of flowers in your hair and all around. Although lesser known than Kyoto’s Kiomizudera and Fushimi Inari, Takenaka Shrine is not inferior in beauty, especially during the hanami season. 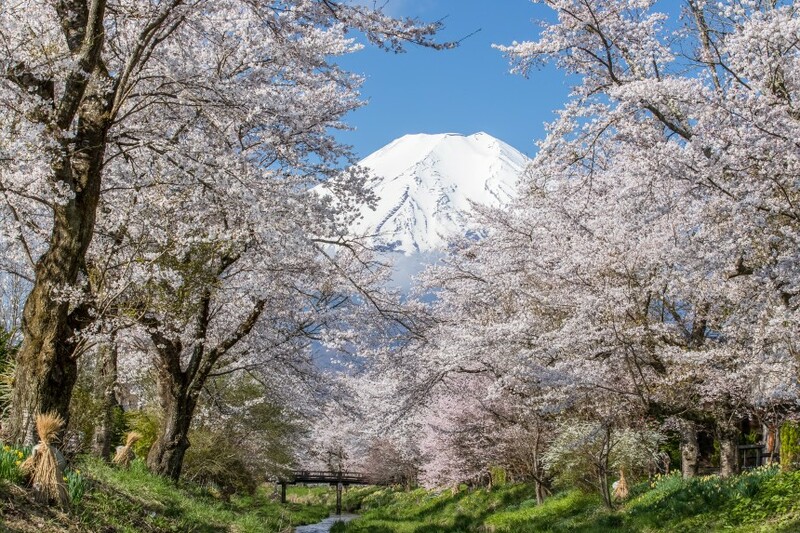 Apart from being the government agency responsible for producing coins and medals, Mint Bureau is also a home to over 100 cherry varieties, including late-blooming yae-zakura trees (pink with more than 5 petals per blossom). The most dreamy sakura spot in Tokyo. 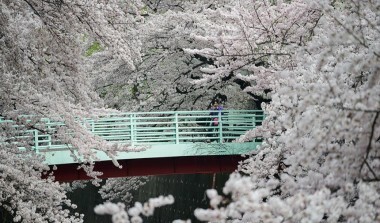 Not crowded during sakura season, Shakuji River is a place where you can enjoy peace and quiet under a shawl of interlacing sakura branches, under which cute little bridges are in abundance. Grassy lawns along the river make it a wonderful spot for picnics and precious times with family. 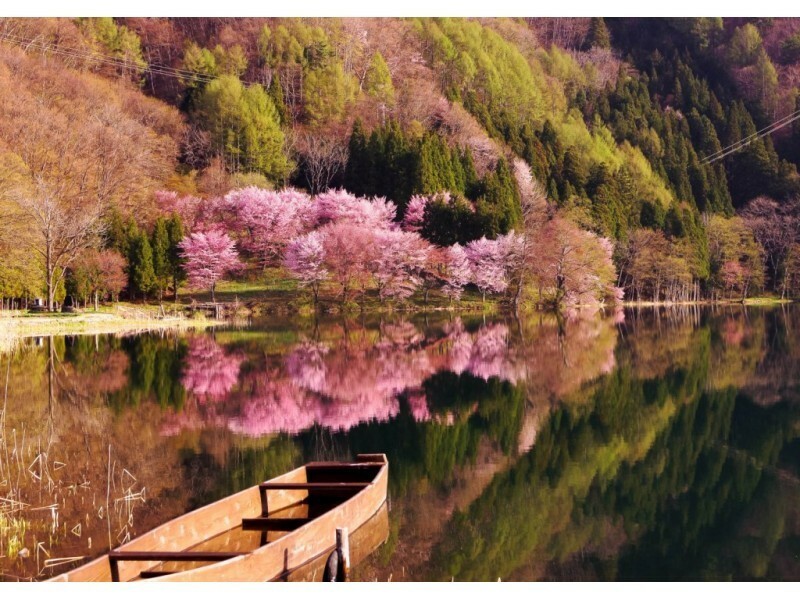 Imagine sakura petals falling on your cheek as you take a nap on a boat, sliding through cherry blossom covered waters. 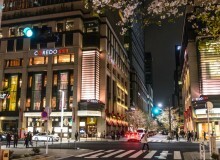 Combine this experience with a walk around the Imperial Palace and a visit to the East Gardens. Cherry blossoms here were planted in the early 18th century. The place resembles a more developed Tolkien hobbit village — with a small stream that runs under a wooden bridge and a tiny watermill. Not so famous among tourists, this is a great place to hide from the crowds. One of Japan’s oldest public cemeteries. No festivals, picnics or food stalls are allowed in here, which makes it a very serene location. The mixture of moth-covered stone graves and cherry blossoms transforms it into a sacred, enchanting space. 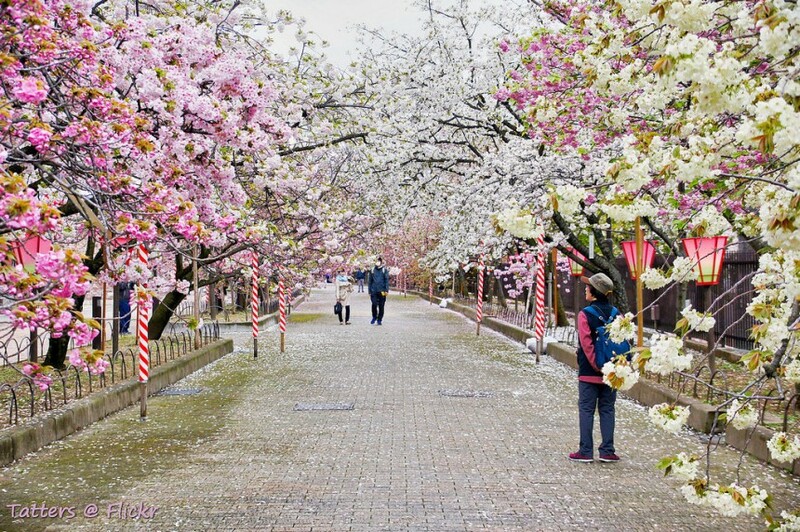 More than 500 beautiful cherry blossoms grow next to the Hikawa Shrine, famous for being an admired spot for the god of marriage. Wooden decks and freshly grown grass at the riverbanks radiate a very warm, welcoming atmosphere. 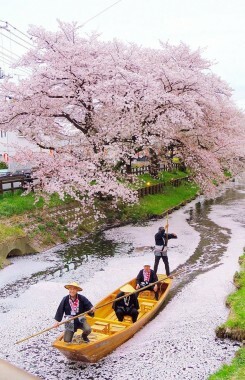 At the opening of the “Koedo Kawagoe Spring Festival” a boat-crossing event is held at the river, during which you can enjoy a short cruise on a traditional Japanese boat. 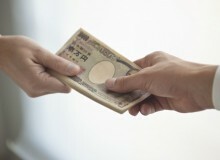 LivingIs Japan A Cash Country?